Ok, now that we have that settled, let’s get back to the order of the day. Document flow in Office 365. I can hear you thinking. So what is considered a good document flow? When you start to define a document flow, you need to think like a user. You need to act like a user. Wait a second, maybe it’s best that you too are a user! What I actually mean is, don’t let an administrator that is barely using Office 365 as a user define this flow. Let a superuser or ambassador come up with the idea, then guide him in the right direction. What is a good document flow? Ideally, a user starts to work on a document in his personal OneDrive for Business. 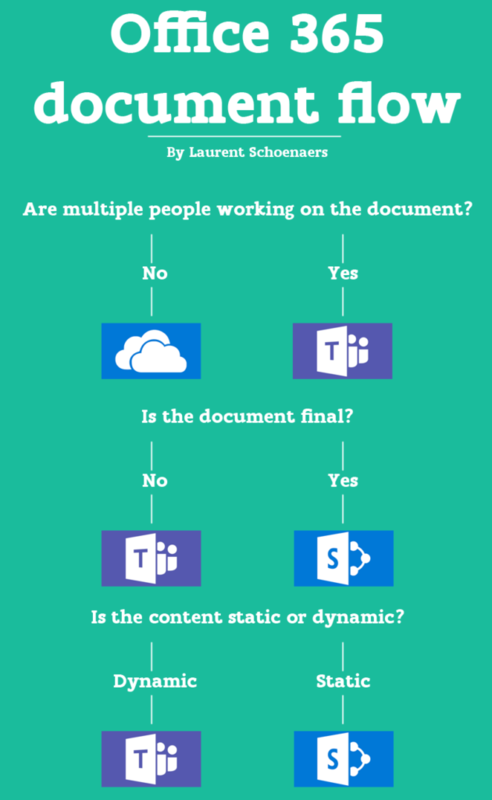 Once the document gets more body, and more people are involved in giving structure to the document, the file should be moved to Microsoft Teams. Allowing the team to closely work together, using all the advantages of Teams. Ofcourse, when working in a team, it is not necessarily required to start the creation of a document in OneDrive. When working with team files, Microsoft Team is a feasible entry point as well. When no teamwork is involved, the file must remain in OneDrive for Business until it has reached a final state. Personal, work related files, will always reside in OneDrive. Once the document reached its final state, it is desirable that the file is viewable by more or even all users. This is the moment when we want the user to move the file into SharePoint Online. He or she must be guided, with documentation and governance plans, through the wilderness of information architecture – let’s be honest here for a moment, if your information architecture is a jungle, it might be a better idea to redesign it? There we go, pretty simple isn’t it?